When last we left our intrepid heroes, they had just caught a glimpse of the rare and elusive Bicknell’s Thrush. Actually, only Corey, Patrick, and I actually saw the high timber thrush; Will arrived at the top as the bird winged off, just in time for us to begin the long scramble down Wakeley Mountain. The dramatic pitch of the ascent coupled with the slickness of the exposed boulders gave us all reason to fear the return trip, but the birding gods continued to smile on us as we made it down without a single grievous injury between us. The group even added Least Flycatcher and a breeding pair of Rusty Blackbird to the morning’s list. These were, with one notable exception, the highlights of the post-Bicknell’s portion of the day. I could dwell on our fruitless search for Mourning Warblers, conducted over several hours of combing hazardous backcountry dirt roads. I could expound upon the deep disappointment that gripped each of us as Ferd’s Bog, a “can’t-miss” site for Olive-sided Flycatcher, Lincoln’s Sparrow, Gray Jay, and boreal woodpeckers, yielded nothing more exotic than Common Yellowthroat, Magnolia Warbler, and Red-breasted Nuthatch. Were I so inclined, I could even complain about the biting flies, oppressive heat, and nauseating egg sandwich at that gas station in town. But I don’t care about any of these things, though I certainly look forward to returning to the devastatingly cool Ferd’s Bog. No, I don’t care because I finally spotted Ruffed Grouse. 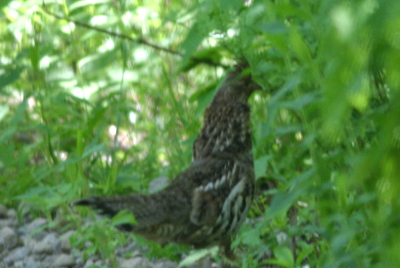 To be specific, I spotted two adult Ruffed Grouse, the second chaperoning three adorable chicks to safety. Each grouse showed exceptionally well. This was by design, since they both acted courageously to divert attention from their young. Ruffed Grouse hens adopt two different strategies to protect their charges. The first tactic is to assume an aggressive posture, hissing and raising feathers. The second weapon in the Bonasa umbellus arsenal, more familiar to grouse gazers, is the old broken wing trick. This display tempts predators with the prospect of a damaged, yet delectable morsel that miraculously heals before dinner is served. We were fortunate enough to witness both maneuvers, with grouselings to boot. Ruffed Grouse has been a nemesis bird for me, which is to say a bird that I should have spotted some time ago that kept evading my gaze. This species is considered the most widely distributed game bird in North America, populating 39 states and plenty of provinces. Grouse are especially abundant in Potter County, Pennsylvania, where Sara and her family have been accustomed to watching ruffed males conducting their spring breeding displays in the middle of just about any road. Yet, every attempt I’ve made to find grouse, in Potter County or elsewhere, has met with naught but disappointment. I’m pleased to say that I’ve cracked the curse and expect gobs of grouse from now on! You will Michael, you will. Sometimes us who see these birds on a regular basis, don’t appreciate seeing them as much! Great list of other birds that you found! One of the “protective” strategies of grouse that I always enjoyed, was when the hen was still setting on eggs. She will stay on the nest, relying on camouflage, even if you walk right up to her. I wouldn’t do it now, as I know better, but when I was a kid we’d walk right up to a hen on the nest and pet her.